If you are looking for a easy and inexpensive turkey project for the kids to make before Thanksgiving, maybe this Simple Turkey is that project. Although I used burlap for the body, consider using pieces of print fabric or construction paper instead. I used greeting cards for the feathers because I wanted the paper stiff enough to hold its shape and colorful, but not all one color. 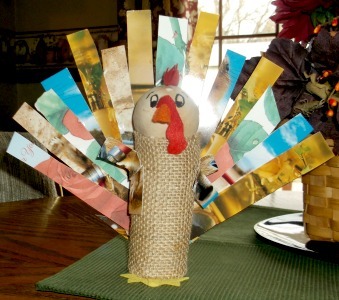 For the instructions to make this turkey, find the directions for “Simple Turkey” in the Thanksgiving Projects Gallery in the sidebar. This entry was posted in Categories and tagged art, christmas cards, easy, feathers, for kids, greeting cards, project, simple turkey, Thanksgiving, tp roll. Bookmark the permalink.